We all want to be an expert. And you have been working in SAP for years with no problems at all. But, don't you ever wonder what you don't know? Everyone can continuously improve their skills. And just like someone getting ready to go back to school, you should take an assessment test to see exactly where you are today. Do you want to find out how good your basic SAP skills are? 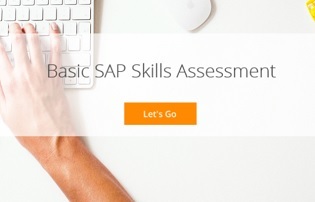 Then enroll in our free SAP Skills Assessment and take the test! Register or login to enroll!